No, she is not “dancing with the stars” again, but rather, “rising (above)” with the stars. In a recent show last week, Ngo Thanh Van and Yen Trang reportedly set the stage on fire with their smexy moves and even smexier outfits. 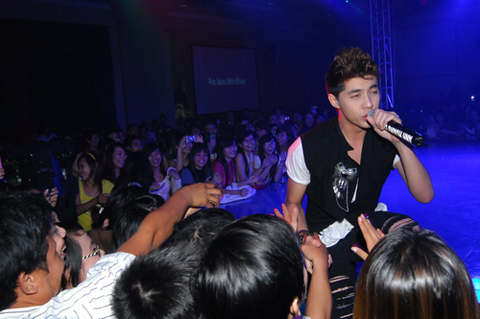 Ngo Thanh Van’s live show titled Rise Above with Stars, a second in her tour series, opened with overwhelming success in Da Nang on Nov. 19, 2010. Truth be told, management had only expected the audience count to be nearing 800 attendees. However, the actual turnout was triple this original estimation at 2000 attendees. This unexpected turn of events caused much chaos prior to the performance, and required much effort by security and staff members to enforce crowd control. Ngo Thanh Van (NTV) proves she can still take center stage, despite her long hiatus from the music scene these past few years. It is in this live show that NTV debut her latest single, “Shut Up” (yikes, cue witty antis’ jokes -B), with the collaboration of DJ Addy Tran, an up-and-coming artist who will also be a major component in many future projects concerning protege band, 365. The show also featured other artists such as Yen Trang, Lieu Anh Tuan, Noo Phuoc Thinh, and MC Tuan Nam. In my opinion, if we take out the 1,000 screaming fans who were there for Noo Phuoc Thinh and the 200 who came hoping Johnny Tri Nguyen would be there, that still leaves us the original 800 that management correctly predicted. It is a wonder though, how NTV can juggle all these ventures and still keep a boyfriend. Much respect to the lady for her work ethic at the very least hehe. The boots don’t go with the outfit. And the outfit itself is…sigh. what is there to come back to? She should stop singing/dancing/acting. The outfit also has to go. She has a new song out, it’s called “Cu Im Lang”.